« Won’t you cut yourself on glass?…etc. OK, OK…there’s no such thing (as far as I know). I’m not even sure what it would look like. But, as I’m disappearing tomorrow for some bootfoot skiing this weekend, I thought snow was an appropriate topic. If you read below about all the barefoot running misconceptions, you know that normal people thing one can’t run in the snow. Well, check out Barefoot Ted (of Born to Run fame) to the left…I guess one can! According to his blog, he’s doesn’t like it much, but he did make it mile. Impressive! 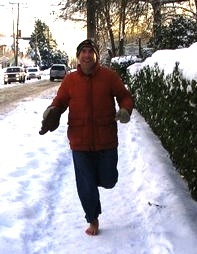 Barefoot John Sifferman wrote a great blog called Barefoot Running on the Snow – 5 Tips to Help You Make the Transition. The advice is pretty simple, but well worth a read. The best part is the video his wife took of John’s first barefoot steps through the snow; it’s inspiring. And, following the blog is a great thread of discussion. My own experience is that running on packed snow after the feet have warmed up can actually feel refreshing. But loose stuff squeezing up between your toes early in the run when its in the teens…that’s starting off on the wrong foot, if you will. See you next week. This entry was posted on February 3, 2010 at 8:25 pm and is filed under Barefoot Running, Experience, Other Runners. You can subscribe via RSS 2.0 feed to this post's comments. Maybe this explains what I saw! See today’s post on my blog, ‘Barefoot in the Snow’. I found this article on rating the top 10 resorts. Maybe you can try barefoot skiing here good luck! It also gives info on best moguls, chutes, and snowboard parks…I love it…enjoy!